While Shaman, the followup album to 1999's surprise smash, Supernatural, did not enjoy the popular or critical success of its predecessor, it did feature a couple of fine songs. One such is the rootsy, soulful piece called "Nothing At All," sung by hip-hop soul artist Musiq (aka Musiq Soulchild). Penned by Matchbox 20's Rob Thomas and veteran songwriter Cory Rooney (Jennifer Lopez, Toni Braxton, Mary J. Blige, et al), Nothing At All makes good use of many of the weapons in Carlos' and his bands' arsenals. First is the prominence of authentic Latin percussion which drives the track. Consistently mostly of congas and various hand percussion instruments, the rhythm is both subtle and compelling. Not only that, but the producers orchestrate the percussion and guitar tracks to create a dynamic build throughout the song. Carlos begins with melodic runs on a nylon-stringed acoustic guitar, ala "Maria Maria," of which this song is reminiscent. This is a style at which Santana excels, effortlessly weaving his trademark harmonic and rhythmic phrasing between the vocal lines. But an unusual touch is that there are two dynamic levels within the first verse -- the 2nd half incorporating a repeated chordal motif (probably enhanced, for crispness, in the studio). During the chorus, Carlos adds runs on the electric, albeit with a similar flavor, which maintains consistency. His solo is short and pithy, and most of his guitar playing occurs throughout the vocal parts. 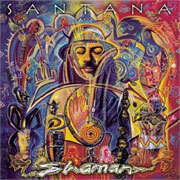 Although it was overshadowed on the charts by the exuberant "This Game of Love," the collaboration with Michelle Branch, Nothing At All captures much more of the sound that Santana has made famous during his more than 40-year career.